Cisplatin (CP) is an anti-cancer drug used for treatment of solid tumors, but the major adverse effect is drug-induced nephrotoxicity. The current study aimed to determine biomarkers that might predict nephrotoxicity induced by CP using serum or urinary proton nuclear magnetic resonance (1H NMR) spectral data in male Sprague-Dawley (S-D) rats. CP (0, 0.5 or 5 mg/kg) was intraperitoneally (i.p.) administered for single dose. Animals were sacrificed 2 days (D2) or 8 days (D8) after administration of CP in order to perform analysis of serum biochemistries and histopathologic examination. Urine samples were collected every 24 hr from pre-treatment to sacrifice. Serum and urinary 1H NMR spectral data revealed apparent differential clustering between control and CP-treated groups as evidenced by principal component analysis (PCA) and orthogonal projections to latent structures-discriminant analysis (OPLS-DA) in global and targeted profiling. The concentrations of endogenous serum metabolites, alanine, betaine, glucose, glutamine, lactate, and leucine were significantly increased on D2. Urinary concentrations of alanine, glucose, glycine, guanidinoacetate, acetate, and lactate were significantly elevated on D2 or D8, whereas concentrations of urinary metabolites, citrate and hippurate were significantly decreased on D2 or D8. The correlation of serum and urinary 1H NMR OPLS-DA with serum biochemistry and renal histopathologic changes suggests that 1H NMR urinalysis may be used to reliably predict or screen CP-induced nephrotoxicity. Data suggest that these altered endogenous metabolites might serve as specific biomarkers for CP-induced nephrotoxicity. The kidney is one of the primary target organs for drug-induced toxicity due to high cardiac blood flow into the kidney and high concentrated chemicals in the tubular fluid (Tiong et al., 2014). The incidence of drug-induced kidney injury has been increasing with easy availability of medicine, including nonsteroidal anti-inflammatory drugs (NSAIDs), antibiotics, immunosuppressive drugs, angiotensin receptor blockers, and angiotensin converting enzyme inhibitors (ACEI) (de Mattos et al., 2000; Ejaz et al., 2004; Gupta et al., 2011; Lameire, 2014; Mingeot-Leclercq and Tulkens, 1999; Singh et al., 2003; Tune, 1997). Moreover, the incidence of acute kidney injury (AKI) in patients of intensive care units ranges from 20% to 50% (Case et al., 2013). Drug-induced nephrotoxicity is determined by serum biochemistry and histopathologic examination. However, these traditional methods may not fulfill assessment of kidney injury because it is insensitive and nonspecific in pre-clinical studies. The general parameters of clinical chemistry of kidney injury are blood urea nitrogen (BUN) and serum creatinine. However, these biomarkers generally denote kidney damage after a significant loss of kidney functional capacity (Boudonck et al., 2009; Fuchs and Hewitt, 2011; Hewitt et al., 2004). To assess potential nephrotoxicity of drug candidates early in the drug discovery process could save time and money as well as reduce exposure to nephrotoxicants. Therefore, newer approaches using ‘omics’ by systems-based toxicological technology (e.g., genomics, proteomics, and metabolomics) have been applied to develop predictable biomarkers for nephrotoxicity that provide fast, specific, sensitive, reliable, and relatively noninvasive testing of drug-induced toxicity (Boudonck et al., 2009; Davis and Kramer, 2006; Kim et al., 2010a; Kondo et al., 2012; Rouse et al., 2012; Ryu et al., 2018). Metabolomic approaches are considered useful for developing biomarkers for drug-induced toxicity (Kim et al., 2010b; Kim et al., 2013; Mendrick and Schnackenberg, 2009). The primary analytical method of metabolomics is global determination of spectral pattern of endogenous metabolites or pattern recognition of biomarkers that are altered by chemical toxicity (Beger et al., 2010). Recently, the analytical techniques to detect drug-induced toxicity have been used such as nuclear magnetic resonance (NMR) and mass spectroscopy (MS) coupled with multivariate analysis. Previous studies investigated biomarkers of nephrotoxicity induced by nephrotoxicants using 1H NMR spectral data (Holmes et al., 1998; Kim et al., 2010a). NMR spectroscopy has various advantages over MS-based analysis including (1) simultaneous detection of a great number of compounds in high throughput manner, (2) simple sample preparation, (3) the ability to directly correlate integrated intensities to concentrations, and (4) high intra- and inter-lab reproducibility of the results (Kim et al., 2010a, 2010b). Of multivariate analysis, principal component analysis (PCA) and orthogonal projections to latent structures-discriminant analysis (OPLS-DA) are widely used (Jang et al., 2018). This analytical technique is better than traditional examinations such as biochemistry and histopathology (Jang et al., 2018). In 1971, CP was applied to cancer patients for the first time, and it became available for clinical practice in 1978, as Platinol® (Bristol-Myers Squibb) (Florea and Büsselberg, 2011). CP has been used as an anti-cancer drug in the treatment of many solid-organ cancers, including cancers of soft tissue, bones, muscles, and blood vessels (Miller et al., 2010). The main dose-limiting adverse effect of CP is nephrotoxicity. The nephrotoxicity of CP has been known since its introduction over 25 years ago (Florea and Büsselberg, 2011; Miller et al., 2010). CP is accumulated in renal epithelial cells and up-taken by membrane transporters such as copper transport protein 1 (Ctr1) and organic cation transporter 2 (OCT2) (Ciarimboli et al., 2005). The accumulated CP in cells occurs to induce cell death through the DNA crosslinks, mitochondrial dysfunction, and production of reactive oxygen species (ROS) in renal epithelial cells (Florea and Büsselberg, 2011). Moreover, CP is metabolized to highly reactive thiol by metabolic activation in the kidney to a more potent toxin (Florea and Büsselberg, 2011; Townsend et al., 2003; Townsend and Hanigan, 2002). MS- or NMR-based metabolomics for CP-induced nephrotoxicity have been published. Boudonck et al. (2009) investigated MS-based metabolomics of nephrotoxicity induced by CP, gentamicin, or tobramycin in rats and reported that treatment of these nephrotoxicants induced increased polyamines and amino acids in urine. Uehara et al. (2014) studied MS-based metabolomics for nephrotoxicity induced by 2-bromoethylamine, n-phenylanthranilic, gentamicin, cyclosporine A or CP in rats and reported that these nephrotoxicants caused increased plasma levels of 3-methylhistidine and 3-indoxyl sulfate and decreased guanidinoacetate. Portilla et al. (2007) reported that alanine, glucose, leucine, methionine, 2-oxoglutarate, pyruvate, valine were increased by CP treatment in mouse urine samples using NMR-based metabolomics. Pan et al. (2011) studied NMR-based metabolomics and reported that uridine diphosphate N-acetylglucosamine (UDP-GlcNAc) and N-acetylgalactosamine (UDP-GalNAc) were increased in the CP responding brain tumor cells. Kwon et al. (2011) investigated NMR-based metabolomics for nephrotoxicity induced by CP in rats and reported that the urinary 2-oxoglutarate and succinate were respectively higher or lower compared with pre-treatment. Duarte et al. (2013) reported that unsaturated triglycerides, UDP-GlcNAc, and sorbitol were increased, whereas niacinamide and several amino acids including glutamine, alanine, lysine, methionine, citrulline, phenylalanine and tyrosine were decreased by CP treatment in lung cells using NMR-based metabolomics. However, these biomarkers of nephrotoxicity are not always consistent. Therefore, it is necessary to carry out additional studies that identify better biomarkers of drug-induced kidney injury. The current study was performed to develop specific, and reliable biomarkers for drug-induced kidney injury utilizing CP as a model nephrotoxicant in rats. Experiments were thus conducted using 1H NMR-based metabolomics following CP (0, 0.5, 5 mg/kg) administered intraperitoneally (i.p.) for single dose. CP and imidazole were purchased from Tokyo Chemical Industry Co. Ltd (Chuo-ku, Tokyo, Japan). 3-(Trimethylsily)-1-propanesulfonic acid sodium salt (DSS), and 3-(trimethylsilyl)propionic-2,2,3,3-d4 acid sodium salt (TSP) were obtained from Sigma Aldrich (St. Louis, MO, USA). Sodium azide was purchased from Bio Basic Inc. (Ontario, Canada). Twenty eight male S-D rats (7-week-old) were purchased from Orientbio Inc. (Seongnam, Gyeonggido, Korea). The experimental protocol was approved by Institutional Animal Care and Use Committee of Dankook University (IACUC, approval number, 2012-031). Animals were used after a week acclimatization under standard conditions with a 12-hr light/dark cycle (light 0600-1800) at 20-24°C and 55% ± 5% relative humidity. Food (LabDiet 5L79, Orientbio Inc.) and tap water were provided ad libitum. CP was dissolved with 0.9% saline prior to administration of either 0.5 or 5 mg/kg for single dose. The dose of CP (5 mg/kg for single dose) was selected on the basis of nephrotoxicity in rats (Antunes et al., 2000; Behling et al., 2006; Do Amaral et al., 2008). The fixed doses of CP and 0.9% saline alone were administered i.p. to rats (Table 1). Rats were placed in metabolic cages, and urine samples were collected every 24 hr in glass bottles containing 50 μL of 3% sodium azide from 24 hr pre-dosing and to sacrifice. Urine samples were collected pre-dosing day 0 (D0; -24-0 hr) and post-dosing day 1 (D1; 0-24 hr), day 2 (D2; 24-48 hr), day 3 (D3; 48-72 hr), day 4 (D4; 72-96 hr), day 5 (D5; 96-120 hr), day 6 (D6; 120-144 hr), day 7 (D7; 144-168 hr), and day 8 (D8; 168-192 hr) (Fig. 1). Blood and kidney samples were extracted to examine nephrotoxic parameters on D2 and D8 immediately after urine collection. Blood samples were drawn from the abdominal aorta by using a syringe with 18 gauge needle under anesthesia (CO2), and then these were centrifuged at 2,000 g for 15 min at 4°C. Kidneys were weighed after peeling off the outer capsule. Relative kidney weight was determined by dividing kidney weight by bodyweight. Kidneys and livers were fixed and preserved in 10% formalin. Urine and serum samples were stored at -70°C until analysis. Table 1. Experimental groups for treatment of cisplatin (CP) to Sprague-Dawley rats. Schematic diagram of scheduled collection of blood and urine from CP. Blood was collected from abdominal artery under CO2 anesthesia. Urine was collected for 24 hr using metabolic cages. At necropsy, all animals were carefully examined macroscopically, and then kidneys were isolated and weighed. Weight value is expressed as organ-to-body weight % ratio. Serum biochemistry parameters, including alanine aminotransferase (ALT), aspartate aminotransferase (AST), BUN, creatinine, and triglyceride, were determined using by ADVIA 2400 (Siemens AG, Berlin and Munich, Germany). The urinalysis was carried out on ADVIA 2400 (Siemens AG), using appropriate kits to determine the levels of creatinine and glucose. Fixed kidneys and livers were routinely processed for embedding in paraffin, sectioned, and stained with hematoxylin & eosin (H&E). All processed tissues were grossly and microscopically (× 200) examined using IX53 (Olympus Corporation, Tokyo, Japan). After serum samples were thawed at 4°C, a 350 μL aliquot of the supernatant was added to a microcentrifuge tube containing 350 μL of D2O solution with 4 mM TSP. TSP was used as a qualitative standard for the chemical shift scale. After vortexing, serum samples were analyzed with 1H NMR spectrometer within 48 hr. All spectra were determined using a Varian Unity Inova 600 MHz at Pusan National University (Busan, Korea) operating at 26°C. One-dimensional NMR spectra were acquired with the following acquisition parameters: spectral width 24,038.5 Hz, 3 sec acquisition time, and 128 scan. Additional conditions of a relaxation delay time of 1 sec and saturation power of 4 were set to suppress massive water peaks. The δ0.0-10.0 spectral region was segmented into regions of 0.04 ppm width providing 250 integrated regions in each NMR spectrum. This binning process endowed each segment with an integral value providing an intensity distribution of the whole spectrum with 250 variables prior to the pattern recognition analysis. The spectrum region of water (δ4.5-55.0) was removed from the analysis to prevent variation in water suppression efficiency. The spectra were also identified and quantified using the Chenomx NMR Suite (Chenomx Inc.). After thawing urine samples at 4°C, they were centrifuged to remove solids. A 600 μL aliquot of the supernatant was added to a microcentrifuge tube containing 70 μL D2O solution with 5 mM DSS and 10 mM imidazole. DSS was used as the qualitative standard for the chemical shift scale. In addition, 30 μL 0.42% sodium azide was added. After vortexing, this solution was adjusted to pH 6.8, and the urine sample was analyzed with an NMR spectrometer within 48 hr. DSS was employed as the concentration reference at a concentration of 0.5 mM. Analytical conditions for urine samples are identical to serum analysis such as analytical instruments, NMR spectra acquisition parameters and spectral binning. Identification and quantification of spectra were also determined using same process of Chenomx NMR library. Metabolite concentrations were expressed as relative ratio values normalized to creatinine concentration, assuming a constant rate of creatinine excretion in all urine samples. All data were converted from the NMR Suite Professional software format into a Microsoft Excel format (*.xls). One-dimensional NMR spectral data were imported into SIMCA-P (version 12.0, Umetrics Inc., Kinnelon, NJ, USA) for a multivariate statistical analysis performed to examine intrinsic variations in the data set. These data were scaled using centered scaling prior to PCA and PLS-DA. PCA and OPLS-DA score plots were used to interpret intrinsic variation in the data. Variable importance plots (VIP) were also utilized to select putative biomarkers for CP-induced nephrotoxicity. Means and standard deviations (S.D.) of the metabolites were calculated using Microsoft Excel (ver. 2013). Quantitative differences between control and CP treatment groups in terms of urinalysis, serum biochemistry, and serum and urinary concentrations of metabolites were statistically analyzed using the ANOVA followed by Tukey test (Prism 5.01, San Diego, CA, USA). P < 0.05 was considered statistically significant. Each relative kidney weight value is expressed as organ-to-body weight % ratio (Table 2). Relative kidney weights were insignificantly different among dose groups on D2 compared to control (control, 0.77% ± 0.04%; 0.5 mg/kg, 0.75% ± 0.08%; 5 mg/kg, 0.85% ± 0.07%), whereas the changes of relative kidney weights on D8 were significantly increased compared to control group (control, 0.79% ± 0.06%; 0.5 mg/kg, 0.73% ± 0.09%; 5 mg/kg, 1.33% ± 0.35%) (Table 2). Table 2. Changes of relative kidney weights isolated from rats treated with CP (0, 0.5, or 5 mg/kg). Each value represents mean ± S.D..
CP-induced kidney injury was evaluated by serum biochemistry, including BUN and creatinine, which are conventional biomarkers for nephrotoxicity. ALT, AST, and triglyceride were also determined to assess hepatotoxicity caused by CP treatment. The results did not showed increase of serum ALT and AST, which are routinely used as biomarkers of hepatotoxicity (Table 3). Serum BUN level was significantly increased in high dose of CP on D2 and D8 compared to control (Table 3). In creatinine level, results showed significant increase of the higher dose of CP (5 mg/kg) on D8 compared to control (Table 3). The serum triglyceride level, which is related to lipid metabolism, was significantly declined on D2 compared to control, but triglyceride level was not significantly changed on D8 among different dosing groups (Table 3). Table 3. Changes of serum biochemistry from rats treated with CP (0, 0.5 or 5 mg/kg) on D2 or D8. AST, Aspartate aminotransferase ; ALT, alanine aminotransferase; BUN, blood urea nitrogen. Urinary glucose levels were significantly elevated in higher CP treatment (5 mg/kg) on D2, but was not significantly changed on D8 among different dosing groups (Table 4). Serum creatinine level was not significantly changed on D2 compared to control group, whereas it was significantly decreased in high dose of CP on D8 compared to control group (Table 4). Table 4. Changes of urinalysis from rats treated with CP (0, 0.5, or 5 mg/kg) on D2 or D8. In the lower dose of CP (0.5 mg/kg), the results of microscopic examination in kidneys did not produce alterations in renal tissues on D2 and D8. The higher dose of CP (5 mg/kg) treatment caused neutrophil infiltration on D2, and caused neutrophil infiltration, dilated tubules and epithelial cell necrosis in the proximal tubules on D8 (Fig. 2). The renal histopathologic changes in the higher dose of CP (5 mg/kg) treatment were severer than those on D2. Liver histopathology was also examined and did not show pathological damage (data not shown). Representative histopathology of kidneys from rats treated with CP (0, 0.5, or 5 mg/kg) on D2 and D8. Circles indicate neutrophil infiltration proximal tubule. Arrows indicate dilated tubules and epithelial cell necrosis. All processed kidneys were grossly and microscopically (× 200) examined. The spectral region of δ0.0-10.0 was segmented into regions of 0.04 ppm width providing 250 integrated regions in each NMR spectrum from serum samples. Visual examination of NMR spectra showed different intensities of some metabolites among control, lower, and higher dose groups. In global profiling, pattern recognition using PCA and OPLS-DA of the NMR spectra displayed distinct clustering between control and CP treatment groups (Fig. 3). In Fig. 3A and B, both PCA and OPLS-DA showed distinct clustering between the higher dose of CP (5 mg/kg) on D2 and control. Especially on D8, the score plots of PCA and OPLS-DA showed clearly distinct clustering from D2 in pattern recognition using PCA and OPLS-DA (Fig. 3C and 3D). The 32 endogenous metabolites were identified using Chenomx NMR Suite ver. 7.6 (Chenomx Inc., Edmonton, Alberta, Canada). The targeted profiling was shown in Fig. 4. In targeted profiling, the score plots of PCA showed a separate clustering among different dosing groups on D2 and D8 (Fig. 4A and 4D). Pattern recognition using the score plots of OPLS-DA also showed completely distinct clustering of determined serum analysis between control and CP treatment groups on D2 and D8 (Fig. 4B and 4E). These findings in pattern recognition analysis were compared to kidney injury determined by serum biochemistries and histopathologic examination on D2 and D8, and suggested that nephrotoxicity mediated by CP treatment on D8 was more serious than on D2. Significant metabolites were selected using VIP value more than 1 to exhibit meaningfully important metabolites. The 4 serum metabolites as putative biomarkers selected on D2 were glucose, lactate, alanine, and glutamine (Fig. 4C), and the 5 serum metabolites as putative biomarkers on D8 were glucose, lactate, glutamine, betaine, and leucine (Fig. 4F). Global profiling of PCA (R2X=0.867, Q2=0.0.687) (A) and OPLS-DA (R2X=0.859, R2Y=0.478, Q2=0.258) (B) using 1H NMR data from serum samples of rats treated with CP (0, 0.5, or 5 mg/kg) on D2. Global profiling of PCA (R2X=0.925, Q2=0.872) (C) and OPLS-DA (R2X=0.924, R2Y=0.723, Q2=0.0102) (D) using 1H NMR data from serum samples of rats treated with CP (0, 0.5, or 5 mg/kg) on D8. The score plots showed separation of clustering of 5 mg/kg of CP compared to the control group. ● (blue), control; ● (black), 0.5 mg/kg; ● (red), 5 mg/kg. Targeted profiling using PCA (R2X=0.967, Q2=0.743) (A), OPLS-DA (R2X=0.939, R2Y=0.620, Q2=0.494) (B) and VIP (C) for 1H NMR spectra from serum samples of rats treated with CP (0, 0.5, or 5 mg/kg) on D2. On D8, targeted profiling using PCA (R2X=0.907, Q2=0.674) (D), OPLS-DA (R2X=0.933, R2Y=0.312, Q2=0.0776) (E) and VIP (F) for 1H NMR spectra from serum samples of rats treated with CP (0, 0.5, or 5 mg/kg). 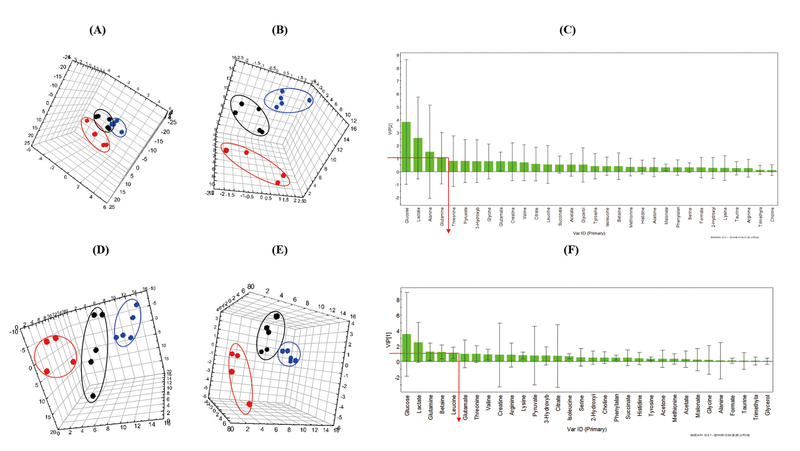 The score plots showed separation of clustering among different dosing groups. VIP showed major metabolites which contribute to separation of the clustering (VIP > 1). ● (blue), control; ● (black), 0.5 mg/kg; ● (red), 5 mg/kg. The pattern recognition using score plots of PCA from individual binning data on D2 did not show different clustering among different dosing groups, but patterns of these samples in the higher dose of CP (5 mg/kg) showed different compared to control (Fig. 5A). 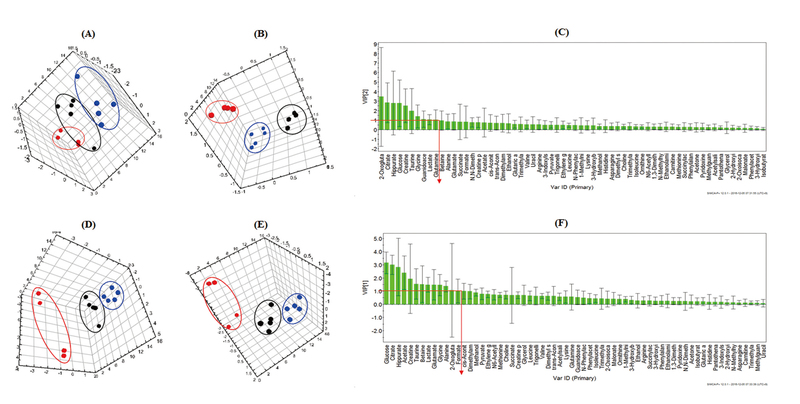 Score plots of OPLS-DA exhibited distinct clustering among different dosing groups (Fig. 5B). In Fig. 5A and 5B, score plots of PCA and OPLS-DA on D8 showed clearly distinct clustering according to CP treatment. The 67 endogenous metabolites were identified. The targeted profiling is presented in Fig. 6. In targeted profiling, score plots of PCA on D2 showed a distinct clustering among different dosing groups (Fig. 6A), and score plots of OPLS-DA on D2 also showed completely distinct clustering of determined urine analysis from control and CP treatment groups (Fig. 6B). Score plots of PCA and OPLS-DA showed definite clustering between control and the higher dose of CP (5 mg/kg) treatment group on D8 (Fig. 6D and 6E). These results in pattern recognition of plotting analysis were compared to nephrotoxicity determined by serum biochemistry and histopathologic examination on D2 and D8, and suggested that nephrotoxicity by CP treatment on D8 is more serious than nephrotoxicity by CP treatment on D2. The significant metabolites were selected using VIP value over 1 to exhibit meaningfully important metabolites. Ten urinary metabolites as putative biomarkers selected on D2 were 2-oxoglutarate, citrate, hippurate, glucose, creatine, taurine, glycine, guanidinoacetate, lactate, and glutamine (Fig. 6C), and 13 urinary metabolites as putative biomarkers selected on D8 were glucose, citrate, hippurate, acetate, creatine, taurine, betaine, lactate, glutamate, glycine, alanine, 2-oxoglutarate, and formate (Fig. 6F). Global profiling of PCA (R2X=0.996, Q2=0.741) (A) and OPLS-DA (R2X=0.986, R2Y=0.866, Q2=0.355) (B) using 1H NMR data from urine samples of rats treated with CP (0, 0.5, or 5 mg/kg) on D2. Global profiling of PCA (R2X=0.920, Q2=0.868) (C) and OPLS-DA (R2X=0.941, R2Y=0.507, Q2=0.346) (D) using 1H NMR data from urine samples of rats treated with CP (0, 0.5, or 5 mg/kg). 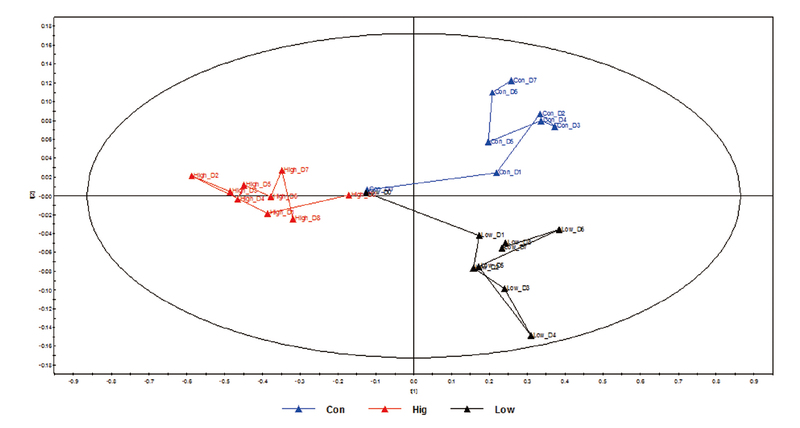 The score plots showed separation of clustering among different dosing groups. ● (blue), control; ● (black), 0.5 mg/kg; ● (red), 5 mg/kg. Targeted profiling using PCA (R2X=0.575, Q2=-0.0198) (A), OPLS-DA (R2X=0.820, R2Y=0.956, Q2=0.711) (B) and VIP (C) for 1H NMR spectra from urine samples of rats treated with CP (0, 0.5, or 5 mg/kg) on D2. Targeted profiling using PCA (R2X=0.747, Q2=0.334) (D), OPLS-DA (R2X=0.744, R2Y=0.464, Q2=0.422) (E) and VIP (F) for 1H NMR spectra from urine samples of rats treated with CP (0, 0.5, or 5 mg/kg). The score plots showed separation of clustering among different dosing groups. VIP showed major metabolites which contribute to separation of the clustering (VIP > 1). ● (blue), control; ● (black), 0.5 mg/kg; ● (red), 5 mg/kg. In time-dependent study, mean scores from urinary samples were plotted using OPLS-DA to monitor endogenous metabolites in urine according to the time course of events in rats after CP treatment. Score plots of OPLA-DA showed that the higher dose of CP (5 mg/kg) moved against control along PC1. The shift was maximal by D2, and then appeared to turn back to D0 position (Fig. 7). Trajectory analysis using OPLS-DA (R2X=0.967, R2Y=0.782, Q2=0.472) based on mean data for 1H NMR of urine samples of rats treated with CP (0, 0.5, or 5 mg/kg), showing a time-related trajectory. The 6 serum metabolites as biomarker for nephrotoxicity were selected on D2 and D8. The serum concentrations of these metabolites including alanine, betaine, glucose, glutamine, lactate, and leucine were determined to assess statistical analysis comparing control and CP treatment groups using ANOVA followed by Tukey test. Dose-dependent increment was observed in concentrations of serum metabolites among different dosing groups on D2 (Fig. 8). Expected change of serum metabolic pathway by CP treatment (0, 0.5, or 5 mg/kg) (*, P < 0.05; **, P < 0.01; ***, P < 0.001). The 15 urinary metabolites as biomarkers for nephrotoxicity were selected according to CP treatment on D2 and D8. Urine concentrations of these metabolites including 2-oxoglutarate, acetate, alanine, betaine, citrate, creatine, formate, glucose, glutamate, glutamine, glycine, guanidinoacetate, hippurate, lactate, and taurine were normalized against creatinine concentration, and determined to assess statistical analysis comparing control and CP treatment groups by ANOVA followed by Tukey test. Urinary levels of alanine, glucose, glycine, and lactate were significantly increased in the higher dose of CP (5 mg/kg) on D2 and D8. The concentration of acetate was significantly increased in the higher dose of CP (5 mg/kg) on D8 and the concentration of guanidinoacetate was significantly increased in the higher dose of CP (5 mg/kg) on D2. Dose-dependent decrement was observed in the concentration of hippurate on D2 and D8. Urinary level of citrate was significantly decreased in the higher dose of CP (5 mg/kg) on D8 (Fig. 9). Expected change of urinary metabolic pathway by CP treatment (0, 0.5, or 5 mg/kg) (*, P < 0.05; **, P < 0.01; ***, P < 0.001). Levels of serum amino acids and its metabolite (alanine, glutamine, leucine, and betaine) and intermediates of energy metabolism (glucose and lactate) were altered by CP treatment on D2 (Fig. 8). Urinary levels of amino acids (alanine and glycine), intermediates of energy metabolism (glucose, lactate, acetate, citrate, and hippurate), and intermediate of creatine biosynthesis (guanidinoacetate) were also altered by CP treatment on D2 or D8 (Fig. 9). CP is an anti-cancer drug used for the treatment of solid tumors. However, the major adverse effect of CP is nephrotoxicity. Kidney is one of the primary target organs of drug toxicity and heavy metals (Lee et al., 2016; Tiong et al., 2014). In the current study, metabolomics approach to biomarkers development for nephrotoxicity was performed using 1H NMR spectral data of serum and urine from rats treated with CP, a well-known nephrotoxicant, to propose a more sensitive method rather than conventional biochemistry and histopathologic examination. The drug-induced nephrotoxicity was evaluated by organ weights, serum biochemistry, urinalysis, and histopathologic examination. The relative kidney weights were significantly increased in the higher dose of CP (5 mg/kg) on D8. It was reported that relative kidney weights were increased in animals treated with CP (5 mg/kg for single dose, i.p.) (Shimeda et al., 2005) and it might be due to acute nephritis (Al-Majed et al., 2002; Taguchi et al., 2005). In the current study, levels of serum BUN and creatinine were significantly increased in the higher dose of CP (5 mg/kg) compared to control (Table 3). The levels of glucose in urine samples of CP treatment groups (0.5 or 5 mg/kg) were increased compared to that of control (Table 4). It was reported that CP-treatment of rats (5 mg/kg for single dose, i.p.) caused increases in serum creatinine and BUN, and urinary glucose levels (Naghizadeh et al., 2008). The levels of creatinine in urine samples of CP treatment groups were decreased compared to that of control. It may be associated with increased serum creatinine level. The histopathologic examination showed that time-dependent nephrotoxicity was induced in the higher dose of CP (5 mg/kg) (Fig. 2). The higher dose of CP (5 mg/kg) treatment caused neutrophil infiltration on D2, and caused neutrophil infiltration, dilated tubules and epithelial cell necrosis in the proximal tubules on D8 (Fig. 2). It was also reported that the CP treatment of rats (5 mg/kg for single dose, i.p.) caused damage to proximal tubule segments and necrosis (Naghizadeh et al., 2008). However, serum ALT and AST levels were not increased by CP treatment. Serum triglyceride was significantly decreased only on D2, but not on D8. Low serum triglyceride level is generally recognized to alteration of lipid metabolism in the liver. The levels were within background levels (37-78.5 mg/dl) of normal SD rats (Hayakawa et al., 2013). Control rats showed relatively higher triglyceride levels (101.00 and 83.00 mg/dl), but these levels are extraordinary. Liver histopathology did not show pathological damage (data not shown). These results showed that nephrotoxicity was determined in the higher dose of CP (5 mg/kg) by conventional tests without hepatotoxicity. Serum and urinary 1H NMR spectra were transformed into meaningful data through multivariate analysis such as global or targeted profiling. Global profiling using multivariate analysis of endogenous metabolites is known to provide reliable information about biologic effects of toxicants (Kim et al., 2010a, 2010b; Jang et al., 2018). In most mammals, only minimal amounts of amino acids are excreted in urine, and reabsorption of filtered amino acids is about 99% in the proximal tubule (Boudonck et al., 2009). However, under kidney injury conditions, urinary amino acids levels could be increased because of impaired reabsorption by renal tubules, increased cellular turnover, or increased permeability of the glomerular membranes (Boudonck et al., 2009; van de Poll et al., 2004). The levels of serum glucose and lactate were increased in the higher dose of CP (5 mg/kg) on D2. The levels of urinary glucose and lactate were increased in higher dose of CP (5 mg/kg) on D2 and D8 (Fig. 9). The urinary level of acetate was increased in the higher dose of CP (5 mg/kg) on D8, whereas the urinary level of citrate was decreased in the higher dose of CP (5 mg/kg) on D8 (Fig. 9). Acetate, citrate, and lactate are intermediates of tricarboxylic acid (TCA) cycle in energy metabolism. These alterations of endogenous metabolites may be related to increased energy metabolism via glycolysis and oxidative stress responses (Beger et al., 2010). The increased serum and urinary lactate levels by CP treatment may be impaired oxidation of pyruvate by mitochondria dysfunction (Schlattner et al., 2006). Portilla et al. (2007) reported using NMR-based metabolomics that amino acids (alanine, leucine, methionine, and valine) and intermediates of energy metabolism (glucose, 2-oxoglutarate, and pyruvate) were increased by CP treatment in mouse urine samples. Kwon et al. (2011) investigated NMR-based metabolomics of nephrotoxicity induced by CP treatment (10 mg/kg for single, i.p.) in rats and reported the urinary 2-oxoglutarate and succinate were respectively higher or lower compared to pre-treatment. Increased urinary 2-oxoglutarate level was also determined in the current study of CP treatment. Dose-dependent decrement was observed in urinary level of hippurate on D2 and D8, whereas the level of glycine was increase in the higher dose of CP (5 mg/kg). Hippurate is synthesized from glycine and benzoic acid in renal and hepatic mitochondria, which secreted by the renal tubular cells and is excreted in the urine (Tzovaras et al., 2011). Thus, the alterations of serum or urinary hippurate and glycine level may be caused by impaired proximal tubular cell (Zuppi et al., 1997). Decreased urinary concentrations of hippurate in rats treated with CP (10 mg/kg) was observed in 1H NMR metabolic profiling (Won et al., 2016). Also, Holmes et al. (1998) and Kim et al. (2010a) reported that urinary concentrations of hippurate was decreased in rats treated with HgCl2 (0.75 mg/kg) of another nephrotoxicant. HgCl2 is rapidly accumulated in the proximal tubule, which cause renal damage in animals (Zalups, 1991). The urinary level of guanidinoacetate was increased in the higher dose of CP (5 mg/kg) on D2. Guanidinoacetate is an intermediate in creatine biosynthesis. In the first reaction of creatine biosynthesis, amidino group from arginine to glycine is transferred to form ornithine and guanidinoacetate which are catalyzed by arginine:glycine amidinotransferase in kidney, and then guanidinoacetate is released into the renal vein. In second reaction of creatine biosynthesis, creatine is synthesized from guanidinoacetate catalyzed by guanidinoacetate methyltransferase in liver (Brosnan and Brosnan, 2004; Carducci et al., 2002). Thus, alteration of guanidinoacetate may be the result of renal malfunction from acute kidney injury by CP treatment. There has been discrepancy among previous reports of CP-treated animals. Portilla et al. (2007) reported increased pyruvate level in urine of CP-treated rats, but Uehara et al. (2014) showed decreased pyruvate level in plasma of CP-treated rats. We determined pyruvate levels in both serum and urine, but no statistical difference was observed between control and CP-treated rats. In conclusion, the current study provides evidence that serum and urinary 1H NMR spectral-based metabolomics are a new approach for biomarkers of CP-induced nephrotoxicity in rats. The conventional nephrotoxicity examination, including serum biochemistry, urinalysis, and histopathologic examination, provided validation for CP-induced nephrotoxicity. These results showed that kidney injury was occurred greater on D8 than D2. Pattern recognition analysis of NMR spectra using PCA and OPLS-DA showed distinct separation of clustering in the serum and urine samples of CP (0.5 or 5 mg/kg) treatment on D2 and D8. The 6 serum metabolites (alanine, betaine, glucose, glutamine, lactate, and leucine) and the 8 urinary metabolites (alanine, acetate, citrate, glucose, glycine, guanidinoacetate, hippurate, and lactate) were altered by CP treatment on D2 or D8. Thus, these proposed serum and urinary biomarkers using metabolomics approach can be reliable and predictable for nephrotoxicity by cisplatin with high-throughput and simple sample preparation. This work was supported by a National Research Foundation of Korea (NRF) grant (NRF-2011-0013659 and NRF-2017R1A2B4004758) funded by the Korea government (MEST). Al-Majed, A.A., Mostafa, A.M., Al-Rikabi, A.C. and Al-Shabanah, O.A. (2002): Protective effects of oral arabic gum administration on gentamicin-induced nephrotoxicity in rats. Pharmacol. Res., 46, 445-451. Antunes, L.M., Darin, J.D. and Bianchi, M.D. (2000): Protective effects of vitamin c against cisplatin-induced nephrotoxicity and lipid peroxidation in adult rats: a dose-dependent study. Pharmacol. Res., 41, 405-411. Beger, R.D., Sun, J. and Schnackenberg, L.K. (2010): Metabolomics approaches for discovering biomarkers of drug-induced hepatotoxicity and nephrotoxicity. Toxicol. Appl. Pharmacol., 243, 154-166. Behling, E.B., Sendão, M.C., Francescato, H.D., Antunes, L.M., Costa, R.S. and Bianchi, Mde.L. (2006): Comparative study of multiple dosage of quercetin against cisplatin-induced nephrotoxicity and oxidative stress in rat kidneys. Pharmacol. Rep., 58, 526-532. Boudonck, K.J., Mitchell, M.W., Német, L., Keresztes, L., Nyska, A., Shinar, D. and Rosenstock, M. (2009): Discovery of metabolomics biomarkers for early detection of nephrotoxicity. Toxicol. Pathol., 37, 280-292. Brosnan, M.E. and Brosnan, J.T. (2004): Renal arginine metabolism. J. Nutr. 134, 2791S-2795S; discussion 2796S-2797S. Case, J., Khan, S., Khalid, R. and Khan, A. (2013): Epidemiology of acute kidney injury in the intensive care unit. Crit. Care Res. Pract., 2013, 479730. Carducci, C., Birarelli, M., Leuzzi, V., Carducci, C., Battini, R., Cioni, G. and Antonozzi, I. (2002): Guanidinoacetate and creatine plus creatinine assessment in physiologic fluids: an effective diagnostic tool for the biochemical diagnosis of arginine:glycine amidinotransferase and guanidinoacetate methyltransferase deficiencies. Clin. Chem., 48, 1772-1778. Ciarimboli, G., Ludwig, T., Lang, D., Pavenstädt, H., Koepsell, H., Piechota, H.J., Haier, J., Jaehde, U., Zisowsky, J. and Schlatter, E. (2005): Cisplatin nephrotoxicity is critically mediated via the human organic cation transporter 2. Am. J. Pathol., 167, 1477-1484. Davis, J.W. and Kramer, J.A. (2006): Genomic-based biomarkers of drug-induced nephrotoxicity. Expert Opin. Drug Metab. Toxicol., 2, 95-101.
de Mattos, A.M., Olyaei, A.J. and Bennett, W.M. (2000): Nephrotoxicity of immunosuppressive drugs: long-term consequences and challenges for the future. Am. J. Kidney Dis., 35, 333-346. Do Amaral, C.L., Francescato, H.D., Coimbra, T.M., Costa, R.S., Darin, J.D., Antunes, L.M. and Bianchi, Mde.L. 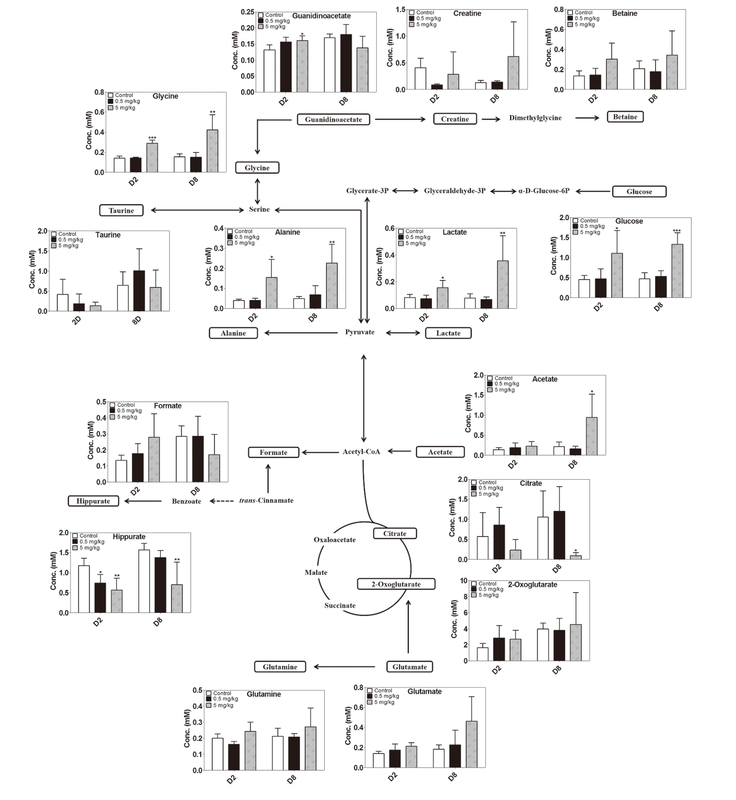 (2008): Resveratrol attenuates cisplatin-induced nephrotoxicity in rats. Arch. Toxicol., 82, 363-370. Duarte, I.F., Ladeirinha, A.F., Lamego, I., Gil, A.M., Carvalho, L., Carreira, I.M. and Melo, J.B. (2013): Potential markers of cisplatin treatment response unveiled by NMR metabolomics of human lung cells. Mol. Pharm., 10, 4242-4251. Ejaz, P., Bhojani, K. and Joshi, V.R. (2004): NSAIDs and kidney. J. Assoc. Physicians India, 52, 632-640. Florea, A.M. and Büsselberg, D. (2011): Cisplatin as an anti-tumor drug: cellular mechanisms of activity, drug resistance and induced side effects. Cancers (Basel), 3, 1351-1371. Fuchs, T.C. and Hewitt, P. (2011): Biomarkers for drug-induced renal damage and nephrotoxicity-an overview for applied toxicology. AAPS J., 13, 615-631. Gupta, A., Biyani, M. and Khaira, A. (2011): Vancomycin nephrotoxicity: myths and facts. Neth. J. Med., 69, 379-383. Hayakawa, K., Mimura, Y., Tachibana, S., Furuya, M., Kodama, T., Aoki, T., Hosokawa, S., Fukui, M., Shibata, S., Yoshida, M., Masuyama, T., Narita, T., Kuwagata, M., Hisada, S. and Maki, E. (2013): Study for collecting background data on Wistar Hannover [Crl:WI(Han)] rats in general toxicity studies--comparative data to Sprague Dawley rats. J. Toxicol. Sci., 38, 855-873. Hewitt, S.M., Dear, J. and Star, R.A. (2004): Discovery of protein biomarkers for renal diseases. J. Am. Soc. Nephrol., 15, 1677-1689. Holmes, E., Nicholson, J.K., Nicholls, A.W., Lindon, J.C., Connor, S.C., Polley, S. and Connelly, J. (1998): The identification of novel biomarkers of renal toxicity using automatic data reduction techniques and PCA of proton NMR spectra of urine. Chemom. Intell. Lab. Syst., 44, 245-255. Jang, H.J., Lee, J.D., Jeon, H.S., Kim, A.R., Kim, S., Lee, H.S. and Kim, K.-B. (2018): Metabolic profiling of eccentric exercise-induced muscle damage in human urine. Toxicol. Res., 34, 199-210. Kim, K.-B., Um, S.Y., Chung, M.W., Jung, S.C., Oh, J.S., Kim, S.H., Na, H.S., Lee, B.M. and Choi, K.H. (2010a): Toxicometabolomics approach to urinary biomarkers for mercuric chloride (HgCl2)-induced nephrotoxicity using proton nuclear magnetic resonance (1H NMR) in rats. Toxicol. Appl. Pharmacol., 249, 114-126. Kim, K.-B., Yang, J.Y., Kwack, S.J., Park, K.L., Kim, H.S., Ryu, D.H., Kim, Y.J., Hwang, G.S. and Lee, B.M. 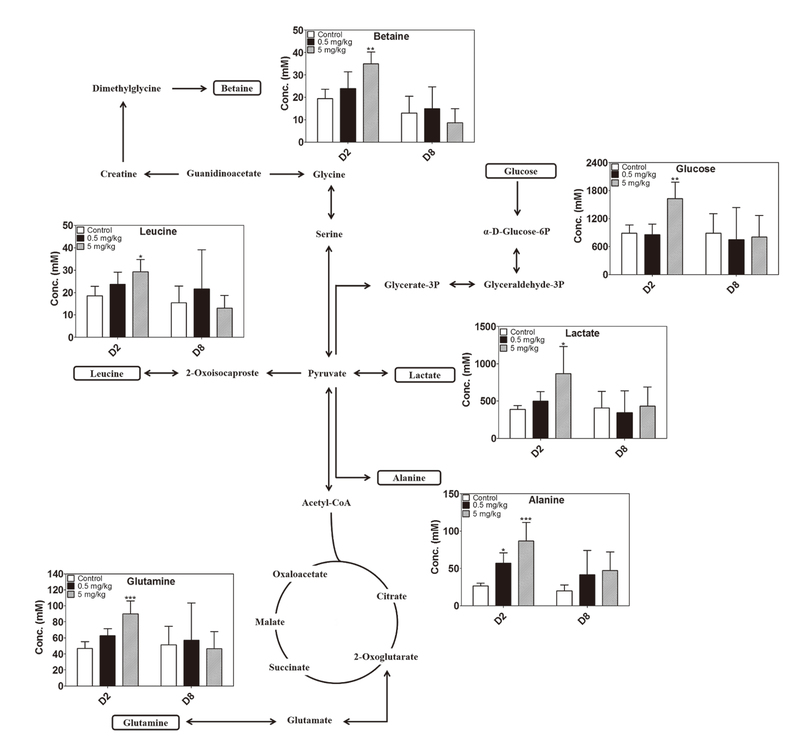 (2010b): Toxicometabolomics of urinary biomarkers for human gastric cancer in a mouse model. J. Toxicol. Environ. Health A, 73, 1420-1430. Kim, K.-B., Yang, J.Y., Kwack, S.J., Kim, H.S., Ryu, D.H., Kim, Y.J., Bae, J.Y., Lim, D.S., Choi, S.M., Kwon, M.J., Bang, D.Y., Lim, S.K., Kim, Y.W., Hwang, G.S. and Lee, B.M. (2013): Potential metabolomic biomarkers for evaluation of adriamycin efficacy using a urinary 1H-NMR spectroscopy. J. Appl. Toxicol., 33, 1251-1259. Kondo, C., Aoki, M., Yamamoto, E., Tonomura, Y., Ikeda, M., Kaneto, M., Yamate, J., Torii, M. and Uehara, T. (2012): Predictive genomic biomarkers for drug-induced nephrotoxicity in mice. J. Toxicol. Sci., 37, 723-737. Kwon, H.N., Kim, M., Wen, H., Kang, S., Yang, H.J., Choi, M.J., Lee, H.S., Choi, D., Park, I.S., Suh, Y.J., Hong, S.S. and Park, S. (2011): Predicting idiopathic toxicity of cisplatin by a pharmacometabonomic approach. Kidney Int., 79, 529-537. 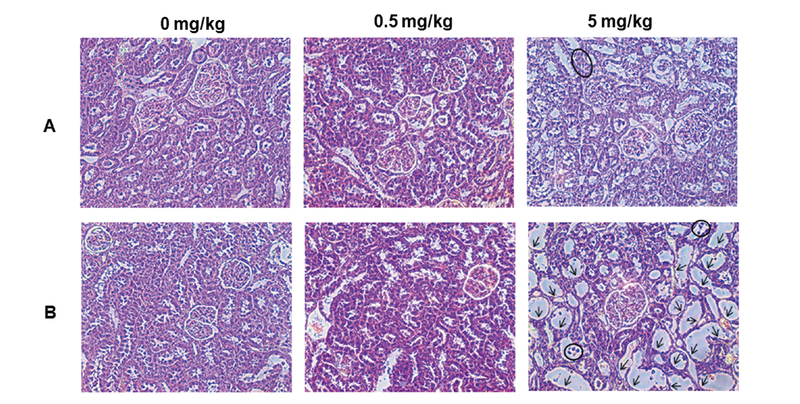 Lameire, N. (2014): Nephrotoxicity of recent anti-cancer agents. Clin. Kidney J., 7, 11-22. Lee, J.-Y., Tokumoto, M., Hattori, Y., Fujiwara, Y., Shimada, A. and Satoh, M. (2016): Different regulation of p53 expression by cadmium exposure in kidney, liver, intestine, vasculature, and brain astrocytes. Toxicol. Res., 32, 73-80. Mendrick, D.L. and Schnackenberg, L. (2009): Genomic and metabolomic advances in the identification of disease and adverse event biomarkers. Biomarkers Med., 3, 605-615. Miller, R.P., Tadagavadi, R.K., Ramesh, G. and Reeves, W.B. (2010): Mechanisms of Cisplatin nephrotoxicity. Toxins (Basel), 2, 2490-2518. Mingeot-Leclercq, M.P. and Tulkens, P.M. (1999): Aminoglycosides: nephrotoxicity. Antimicrob. Agents Chemother., 43, 1003-1012. Naghizadeh, B., Boroushaki, M.T., Vahdati Mashhadian, N. and Mansouri, M.T. (2008): Protective effects of crocin against cisplatin-induced acute renal failure and oxidative stress in rats. Iran. Biomed. J., 12, 93-100. Pan, X., Wilson, M., Mirbahai, L., McConville, C., Arvanitis, T.N., Griffin, J.L., Kauppinen, R.A. and Peet, A.C. (2011): In vitro metabonomic study detects increases in UDP-GlcNAc and UDP-GalNAc, as early phase markers of cisplatin treatment response in brain tumor cells. J. Proteome Res., 10, 3493-3500. Portilla, D., Schnackenberg, L. and Beger, R.D. (2007): Metabolomics as an extension of proteomic analysis: study of acute kidney injury. Semin. Nephrol., 27, 609-620. Rouse, R., Siwy, J., Mullen, W., Mischak, H., Metzger, J. and Hanig, J. (2012): Proteomic candidate biomarkers of drug-induced nephrotoxicity in the rat. PLoS One, 7, e34606. Ryu, S.H., Kim, J.W., Yoon, D., Kim, S. and Kim, K.B. (2018): Serum and urine toxicometabolomics following gentamicin-induced nephrotoxicity in male Sprague-Dawley rats. J. Toxicol. Environ. Health A, 81, 408-420. Shaw, M. (2010): Cell-specific biomarkers in renal medicine and research. Methods Mol. Biol., 641, 271-302. Schlattner, U., Tokarska-Schlattner, M. and Wallimann, T. (2006): Mitochondrial creatine kinase in human health and disease. Biochim. Biophys. Acta, 1762, 164-180. Shimeda, Y., Hirotani, Y., Akimoto, Y., Shindou, K., Ijiri, Y., Nishihori, T. and Tanaka, K. (2005): Protective effects of capsaicin against cisplatin-induced nephrotoxicity in rats. Biol. Pharm. Bull., 28, 1635-1638. Singh, N.P., Ganguli, A. and Prakash, A. (2003): Drug-induced kidney diseases. J. Assoc. Physicians India, 51, 970-979. Taguchi, T., Nazneen, A., Abid, M.R. and Razzaque, M.S. (2005): Cisplatin-associated nephrotoxicity and pathological events. Contrib. Nephrol., 148, 107-121. Tiong, H.Y., Huang, P., Xiong, S., Li, Y., Vathsala, A. and Zink, D. (2014): Drug-induced nephrotoxicity: clinical impact and preclinical in vitro models. Mol. Pharm., 11, 1933-1948. Townsend, D.M., Deng, M., Zhang, L., Lapus, M.G. and Hanigan, M.H. (2003): Metabolism of Cisplatin to a nephrotoxin in proximal tubule cells. J. Am. Soc. Nephrol., 14, 1-10. Townsend, D.M. and Hanigan, M.H. (2002): Inhibition of gamma-glutamyl transpeptidase or cysteine S-conjugate beta-lyase activity blocks the nephrotoxicity of cisplatin in mice. J. Pharmacol. Exp. Ther., 300, 142-148. Tune, B.M. (1997): Nephrotoxicity of beta-lactam antibiotics: mechanisms and strategies for prevention. Pediatr. Nephrol., 11, 768-772. Tzovaras, V., Tsimihodimos, V., Kostara, C., Mitrogianni, Z. and Elisaf, M. (2011): Aminoglycoside-induced nephrotoxicity studied by proton magnetic resonance spectroscopy of urine. Nephrol. Dial. Transplant., 26, 3219-3224. Uehara, T., Horinouchi, A., Morikawa, Y., Tonomura, Y., Minami, K., Ono, A., Yamate, J., Yamada, H., Ohno, Y. and Urushidani, T. (2014): Identification of metabolomic biomarkers for drug-induced acute kidney injury in rats. J. Appl. Toxicol., 34, 1087-1095.
van de Poll, M.C., Soeters, P.B., Deutz, N.E., Fearon, K.C. and Dejong, C.H. (2004): Renal metabolism of amino acids: its role in interorgan amino acid exchange. Am. J. Clin. Nutr., 79, 185-197. Zalups, R.K. (1991): Renal accumulation and intrarenal distribution of inorganic mercury in the rabbit: effect of unilateral nephrectomy and dose of mercuric chloride. J. Toxicol. Environ. Health, 33, 213-228. Zuppi, C., Messana, I., Forni, F., Rossi, C., Pennacchietti, L., Ferrari, F. and Giardina, B. (1997): 1H NMR spectra of normal urines: reference ranges of the major metabolites. Clin. Chim. Acta, 265, 85-97. Won, A.J., Kim, S., Kim, Y.G., Kim, K.B., Choi, W.S., Kacew, S., Kim, K.S., Jung, J.H., Lee, B.M., Kim, S. and Kim, H.S. (2016): Discovery of urinary metabolomic biomarkers for early detection of acute kidney injury. Mol. Biosyst., 12, 133-144.